There I was, driving down a blacktop road on the way home to the farm — and driving too fast, too. The sun had sunk low in the sky, and in the glare I nearly missed seeing them. My brain first registered ‘Canada Geese’, which is a reasonable quick assumption because that’s the type of big wild bird that’s usually browsing in corn stubble this time of year. Then my brain yelled ‘whoa!’ And I hit the brakes. Wrong color, argued the brain. Wrong necks. Not geese. By this time I was well past the birds, but had the truck stopped. I backed up the truck for a better look, which first consisted of backing up enough to spot them again, and then backing up some more so I could see them with the sun on their faces instead of trying to see them with the sun in my eyes. Of the four swans in the field, two wore identification bands around their necks. Since they were some distance away, I couldn’t read the numbers on their bands. I probably could have read it through the telephoto lens, but once I whipped out the camera and snapped that 500 mm monster on, I wasn’t thinking about stuff like that. I was setting up the tripod in the middle of the road, watching for approaching traffic, trying to deal with the late afternoon glare of the sun, and hoping the birds didn’t spook and fly away. Note: not one car, truck, or farm tractor loaded with big bales of hay came by in the twenty minutes I gawked and shot photos of the birds. And there’s nothing unusual about that. I was, after all, pretty much in the middle of nowhere taking a shortcut back to the farm, which is at the edge of nowhere. I never managed to get any closer to the swans. But they didn’t leave either. The distance was more than I’d have liked from a photographic point of view. But I was happy enough to watch them and not push any further into their comfort zone. They did seem a bit nervous when I moved to the edge of the field, so I returned to my spot in the road, and they returned to where they’d been browsing. Three browsed, and one kept an eye on me. Until it had an itch. This one doesn’t look nervous now. I guess if a bird will scratch an itch that’s down there with you watching, it’s relatively at ease. Kind of like people. When I looked at the photos later, I realized the numbers on the neckbands were clearly readable. An agent with the state conservation department passed on the 800 number for reporting the sighting and seemed as excited as me about swans, which are just beginning to migrate to this region in winter. Eleven swans had been spotted on a river some ten miles away, and they’d stayed in the area several days. These could have been part of that group or a different group. Judging from the band color, the agent thought my swans had flown in from Iowa, the Dakotas, or Minnesota. What conservation officials really hope to see soon is evidence of a nesting pair in Missouri. 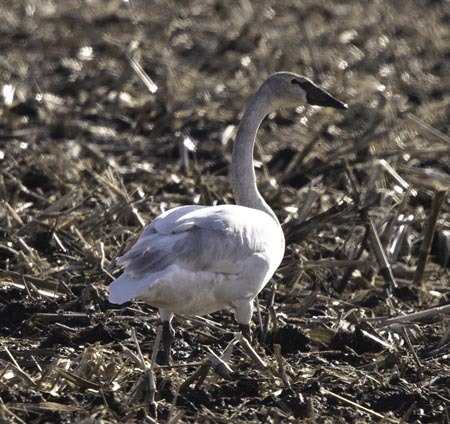 Historically, the trumpeter swan’s territory ranged from the Bering Sea, across most of Canada, and southward into Missouri, Illinois, and Indiana. Records exist of trumpeter sightings in Missouri in the late 1800s and into the early 1900s. Demand for the skin, feathers, meat and eggs led to their near extinction. By 1932, only 72 were known to exist worldwide. Recovery efforts since then have been moderately successful. Some 16,000 now exist worldwide, but they’re still rare in much of their former range. In Missouri, a transplanted pair of trumpeter swans survived and lived for several years in the 1980s at Mingo National Wildlife Refuge . For more about trumpeter swans, you can check out the Seattle Audobon Society webpage. 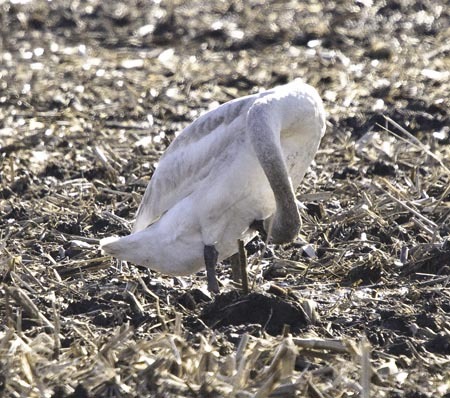 Trumpeters are more commonly seen in the Pacific Northwest, it seems, than this part of the Midwest. The Michigan Department of Natural Resources also has an excellent page on trumpeters. 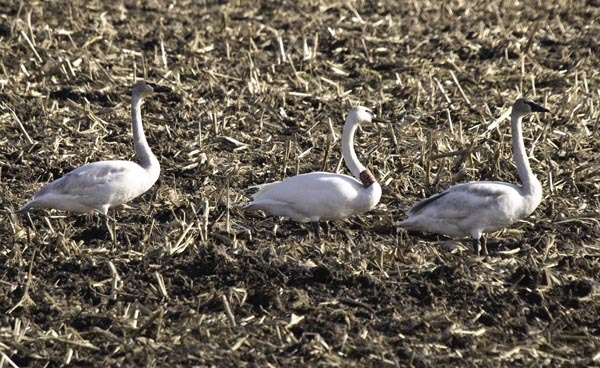 That state has an active restoration program for trumpeter swans. If you’re fortunate enough to spot a trumpeter swan sporting a less-than-stylish numbered neckband, grab some binoculars if you can and get the numbers. You can report the sighting, with the band numbers, at www.reportband.gov or call 800-327-2263. 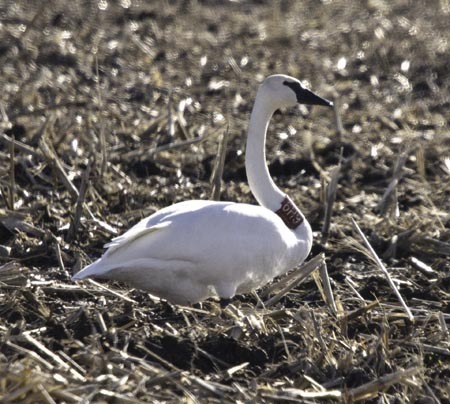 More information about the bands can be found at the Trumpeter Swan Society’s website. I am pleased to find your site and hear about your Trumpeters. I coordinate Trumpeter Watch, a Citizen Science effort to track swans moving into new winter habitat. You can find information on the program at http://www.trumpeterswansociety.org/csp-trumpeter-watch.html. 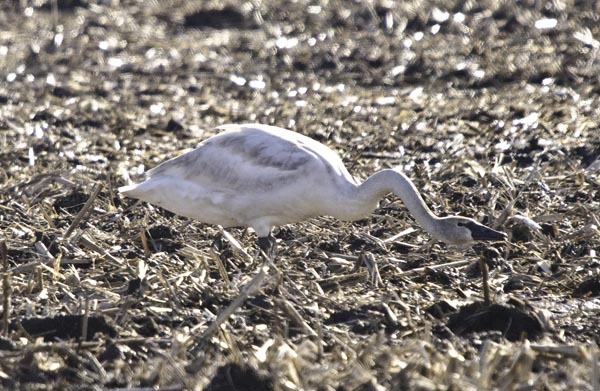 We have a great deal of information on Trumpeters as well, including detailed identification, resources for teachers and information on threats to swans from lead, powerlines and more. We have a chart to help you see the source of these collars, Red 6H9 is an Iowa bird, but I’ll inquire with the biologist there to get you more information. Great photos and post, thank you! Fantastic find for you! I’d like to think that my lake will be the first nesting site for a pair of swans in Missouri, so the closer they are spotted to my woods, the better. Peg – Thanks for the information. I added the Trumpeter Watch link to the post above so the link would show up better. Something funky with the blog template is turning off the color highlights on links, so I have to make manual repairs, and I haven’t figured out the fix within comments yet. Pablo – Wouldn’t that be great? Probably it wouldn’t be great because I’m sure the MDOC would restrict access to the area, which might include me. Hmm, hadn’t thought of that possibility, Pablo. That could be problematic.